The Sandy Springs Society, the largest philanthropic group in Sandy Springs, was founded in March, 1988. Sixteen Sandy Springs women gathered to form a philanthropic organization to benefit the Sandy Springs community. At that time, Sandy Springs was an unincorporated suburb of Atlanta. These community leaders had a vision to organize a group of women who would use their collective talents to raise money for the needs of Sandy Springs, while at the same time forming long-lasting bonds of friendship through their shared effort of community support. By the time the group held its first meeting, the Society had grown to 108 charter members. A majority of the charter members continue their involvement with the organization today and help foster a spirit of dedication among new members. The Sandy Springs Society continues to grow and currently has a membership over 300 women. Membership in The Sandy Springs Society is by invitation only. Women who are invited to join must live in Sandy Springs, be proven leaders in the community, be sponsored by one active member in good standing, endorsed by two active members and approved by the Board of Directors. All members of The Sandy Springs Society must also maintain membership in Heritage Sandy Springs. Heritage Sandy Springs was the first organization to benefit from funds raised by the women of The Sandy Springs Society. Originally known as The Sandy Springs Historic Community Foundation, Heritage Sandy Springs was founded to promote a sense of community and to preserve the history of Sandy Springs. The Society sponsored its first fundraiser, a flower bulb sale, to donate funds to this organization to preserve the property surrounding the springs from which the community got its name. Throughout the community’s history, the site of the springs has been a gathering place because it is a source of fresh drinking water. First the Creek Indians gathered at the springs. Later, the site became a place for travelers to rest when passing through the area. The spring’s site also became well known as a location for church camp meetings. Today, the historic site known as Heritage Green has expanded to include a four-acre park housing the Heritage Sandy Springs Museum at the Williams-Payne House, The Sandy Springs Society Entertainment Lawn, as well as landscaped gardens and walking trails. Heritage Green has become “the heart” of the community and an integral part of the culture and heritage of Sandy Springs. The Society continues to donate no less than 35% of its profits to support Heritage Sandy Springs’ mission of building community by preserving and promoting the historic and cultural identity of Sandy Springs. Long before the “green” movement became widely popular, Society members recognized the need to support not only historic preservation but also environmental preservation. The Society’s longest-running fundraiser, Tossed Out Treasures, supports the green movement by reselling gently used items that are donated by members of the Society and the community at large. Since 1992, Tossed Out Treasures has focused on reselling, reusing and “repurposing” household items, high-end accessories, clothing and furnishings. At the conclusion of the sale, any unsold merchandise is donated to charities. 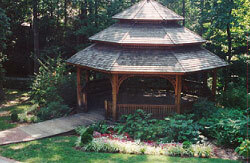 In 2000, the Society added another “green” fundraiser to its repertoire, the Sandy Springs Society Garden Tour. 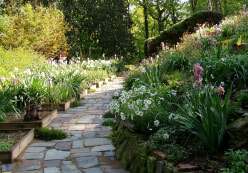 Over the years, the garden tour has showcased dozens of the area’s most unique gardens, including the restored gardens at Glenridge Hall, and the rambling gardens at the home of John and Nancy Williams. Many of the gardens featured on the tour are seldom open to the public and provide a rare treat for garden tour attendees. In 2004, The Sandy Springs Society organized a public art exhibit the first of its kind in Sandy Springs to unite the citizens and foster a sense of community. Taking a cue from the environment around the springs, the organizers chose the lowly Eastern Box Turtle as its mascot. The turtle was chosen not only because it is indigenous to the area but also because it is known for its longevity. The turtle sculpture mold, designed from a drawing by Sandy Springs artist Jack Elrod of Mark Trail Comic Strip fame, was crafted by Cowpainters of Chicago. Standing 56″ high, the finished turtle sculptures were anything but lowly. The turtle’s 49″ wide shell and its underbelly provided the perfect canvas for the artists’ unique designs. The jaunty turtle, standing upright with his arms outstretched, was aptly named Sandy, and the project became known as the Town Turtles of Sandy Springs. As the excitement surrounding the turtles grew, so did the community’s interest and before long, 75 turtles had been sponsored. The turtles could not have come at a more opportune time as the residents of Sandy Springs were making headway on a 25-year effort to become a city. “Slow and steady wins the race” became a rallying cry and Sandy the turtle became the perfect ambassador for Sandy Springs. 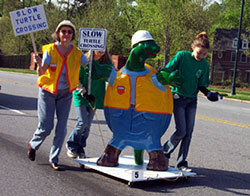 After the initial unveiling at a parade through downtown Sandy Springs, the turtles were displayed at the Sandy Springs Festival; later, the turtles were placed around town. At the conclusion of the exhibit, 700 turtle fans attended Turtles Head Home, an auction where the sculptures were sold for prices ranging from $4,000 to $20,000. The entire project, including the auction and the sale of turtle merchandise and sponsorships, raised over $750,000. Click here to view a map locating all the Turtles of Sandy Springs. 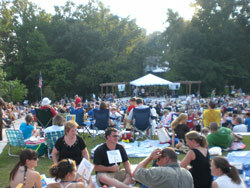 The majority of the funds raised by the Town Turtles of Sandy Springs project were used to develop The Sandy Springs Society Entertainment Lawn at Heritage Green, a community venue for cultural events. Other funds were used to start the Sandy Springs Society Foundation, an endowment for long-term growth, and to purchase city parks from Fulton County when Sandy Springs became incorporated. Town Turtles can still be seen around town today, watching over students at Sandy Springs schools, in front of restaurants and shops, or peaking out from garden gates at private residences. A bronze replica of Sandy with a group of children, donated by Bob Brown, greets visitors at The Sandy Springs Society Entertainment Lawn at Heritage Green. 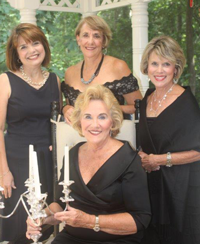 In 2014, the Sandy Springs Society celebrated its 25th Anniversary, Simply Sterling, to recognize the accomplishments of the ladies of the Society and their 25 years of volunteer service to raise over two million dollars for local Sandy Springs non-profits. Held at the Cobb Energy Center, the old out event was attended by the founders and past president, Sandy Springs Society members, and corporate sponsors. The Sandy Springs Society is still the dynamic organization today that its founders envisioned it to be in 1989. As the needs of the community of Sandy Springs grow, the Society redoubles its efforts to raise funds. The group also works yearly to identify new grant recipients that support education, heritage, social services, the arts and the environment. Because the needs of the community are so great and the requests for funds exceed those available, the Society implements an annual grant application process. The Sandy Springs Society is a 501 (c) (3) organization and only donates funds to other 501 (c) (3) organizations that serve the residents of Sandy Springs. While The Sandy Springs Society continues to support Heritage Sandy Springs, over 50 additional non-profits in the Sandy Springs community have benefited from grants. To date, the Society has contributed more than $3.2 million for the betterment of the community. Here is just a brief overview of some of the projects that the Society has recently supported in our community. The City of Sandy Springs acquired 172 acres of park land from Fulton County through a generous grant from The Sandy Springs Society. The park sites include Abernathy Park, Allen Road Park, Big Trees Forest Preserve, Great Park at Morgan Falls, East Conway Pocket Park, Hammond Park, Island Ferry Park, Johnson Ferry Road Park, Morgan Falls Ball Fields, North Fulton Tennis Center, Heritage Green and Ridgeview Park. Additional funds were allocated from the Society to the city to help secure Lost Corner, a future park and nature reserve, on Dalrymple Road and to provide trail signage at Morgan Falls Overlook Park. 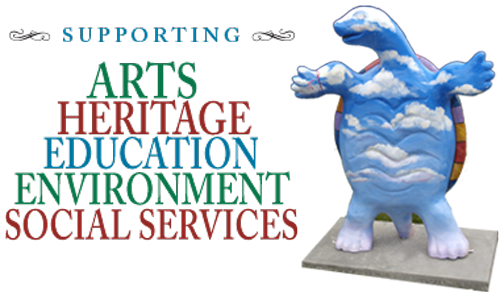 A 2008 grant from the Society benefitted Art Sandy Springs (ArtSS), an organization dedicated to promoting the arts in Sandy Springs. 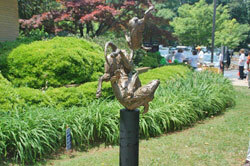 The grant provided the seed money for Art Sandy Springs\’ inaugural sculpture exhibit and provided funds for the purchase of Tumble, a six-foot, cast-bronze sculpture that received the People’s Choice Award. The whimsical Tumble, created by Sandy Springs native David Landis, was donated to the city at the conclusion of the exhibit and is currently on display at the Sandy Springs Branch of the Atlanta-Fulton County Library. The Society also funded the Archival and Research Library in the Bluestone Building at Heritage Green. The library houses artifacts and documents relevant to the Sandy Springs community and serves as an important resource for those researching the area’s history. 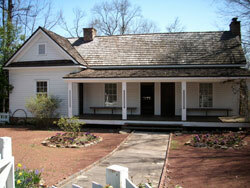 A grant from the Society in 2009 funded the creation of a permanent exhibit on Sandy Springs history in the Heritage Sandy Springs Museum at the Williams-Payne House at Heritage Green. A donation to Riverwood International Charter School provided the sculptural centerpiece in the Global Learning Garden. 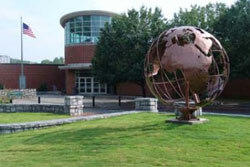 The bronze orb, designed by a group of Advanced Placement Art students, has become the symbol of Riverwood’s International Studies Magnet and International Baccalaureate Diploma Programs and is pictured on the school’s website and in school publications. An additional grant in 2010 funded two student-designed benches for the Global Garden. The Sandy Springs Society has awarded multiple grants to Horizons, an academic, cultural and recreational program designed to encourage students from low-income families to realize their potential. The grants were used to provide nutritious meals to students attending its summer programs. 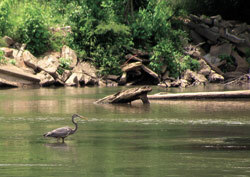 Donations to the Upper Chattahoochee Riverkeeper, an organization whose mission is to advocate for and secure the protection of the Chattahoochee River, its tributaries and watershed, were used to fund scholarships for Sandy Springs students to attend a floating environmental classroom on Lake Lanier. The Sandy Springs Society continually works to identify organizations that perpetuate a community of families with a common interest in a safe and wholesome environment for the growth of children and families.